This was one of the earliest posts I did. The state of Maharashtra. 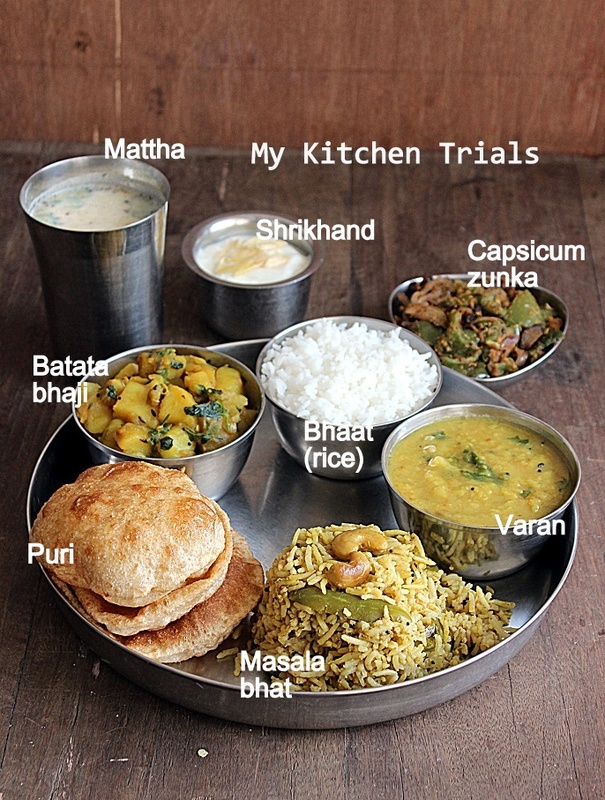 This was one of the easiest one as well, since I blindly followed Pradnya’s post, combining it with her rural Maharashtra thali and changing a thing or two here and there. In India, you are not a mom, if you can’t make pooris. And in my case, it’s not as a mom I have been failing, but as a wife. My son doesn’t like poori, but it’s the man’s favourite food. And with this thali, the pooris came out brilliant for a change. So the man was indeed happy! Pradnya had made a sweetish dal with the thali. 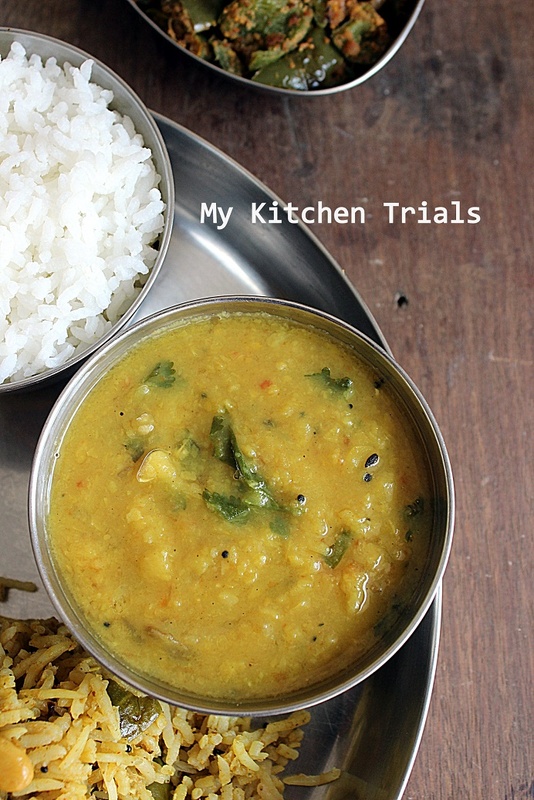 I went for a different version, a simple non sweet basic dal. 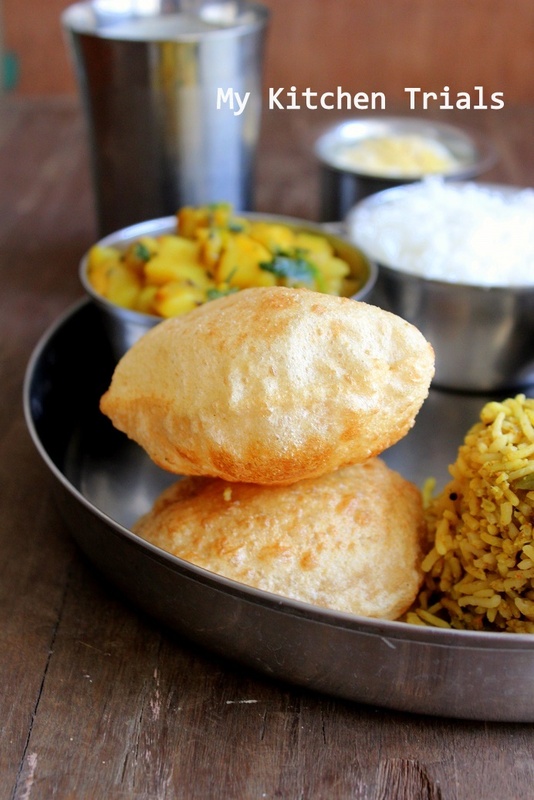 Varan-bhath (rice with dal) is a meal combination all over India and this is just one version. Masale bhath is a spicy flavoured rice. Coconuts, cashew nuts, gherkins all go into this dish. This, apparently, is a regular item in the wedding feast menu. I found these two write ups about food from Maharashtra quite interesting, A Cook at heart and Food For Thought. 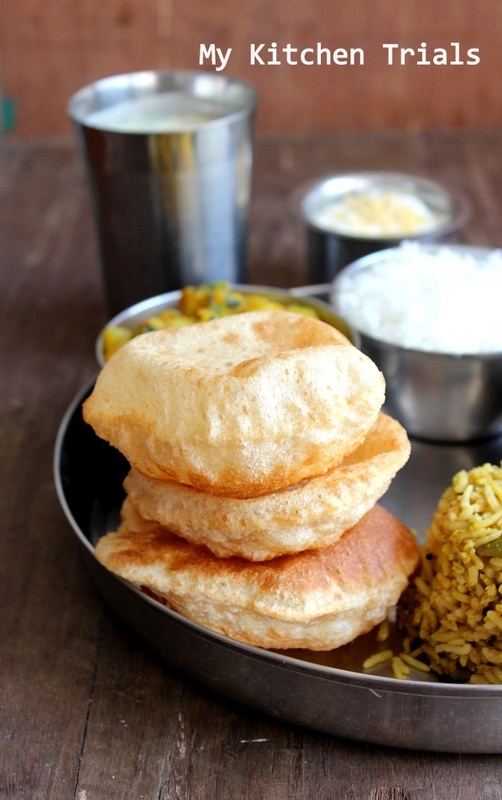 Mine dont like pooris, my kids are great fans of these puffy beauties.. Puri with delicious bhajis looks very filling and satisfying. The thali looks beautiful…and the pooris are perfect…mine betray me at times..but most of the times they do puff up!…well we all do like them but ..it is like twice a year! !…like the simple daal looks nice with mild temperings..
you are not a mom if you do not make puris – lol:) .. Getting the puris perfect is actually an art and you surely have made it beautiful!! Rajani you got me drooling here ..everything looks so perfect..for all the things you say about not getting the perfect puris, those are amazing….The whole thali has got me wanting to eat them right away! Nice choice of dishes you have put together. All of them are so well done. Spectacular spread! Love those puris. Awesome spread as usual Rajani. Puris indeed look PERFECT. looks like you have conquered your fear of deep fried foods during this marathon. Puris look absolutely perfect!!! My kids love poori and I do as well…Every time I make pooris, I will remember your comment :) Lovely spread and a hearty lunch!